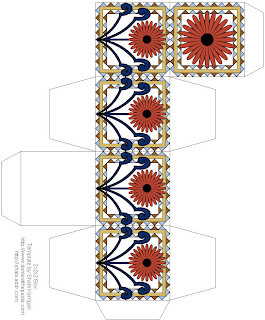 The most recent fabric contest on Spoonflower is Art Nouveau style working with a pre-determined palette of colors. My entry is one I worked on with my daughter and she named it "DaisyShell" because the tiled effect reminds her of shells. You can see the other entries here and vote for your favorite if you have a Spoonflower account. I liked the design we came up with enough to draw this box using the same elements The Turnip and I used in the fabric design. Click on the image for the full sized version. Isn't that palette great? I love palette based contests because they inspire me to work in colors I normally wouldn't. It's beautiful! What a fun palette. I'll be linking.